A great year for Skipton Tennis! Home / Community / A great year for Skipton Tennis! We are very proud to be continued sponsors of Skipton Tennis Centre and the fantastic work they do in our community. The club has helped bring a racket to thousands of children’s hands since it’s reopening in 2006 through it’s strong community coaching programme in our local schools. This year has seen that number grow even further whilst running alongside the club’s thriving weekly coaching programmes for all ages. 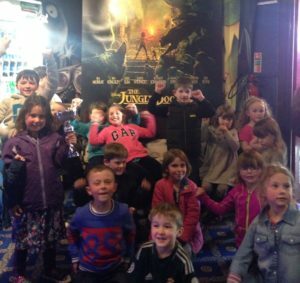 Skipton Tennis and Walker Foster also hosted a joint event at Skipton Plaza cinema earlier this year allowing over 200 children to enjoy the new Jungle Book movie for no cost at all! Primary school tournaments, the club’s talent ID player scheme, multi-skills lessons in our local schools and the work they do in developing students from Craven College into better coaches and young leaders. We look forward to working with the club on exciting future events that will strive to benefit our community.